With 6.17 headed our way soon, tonight's red post collection includes discussion on Yorick's recent champion update teasers, the LoL Funko Pop! figures now available in NA, limited time LCS champion and skin bundles now available, several esports posts including IWCQ 2016 schedule, and more! 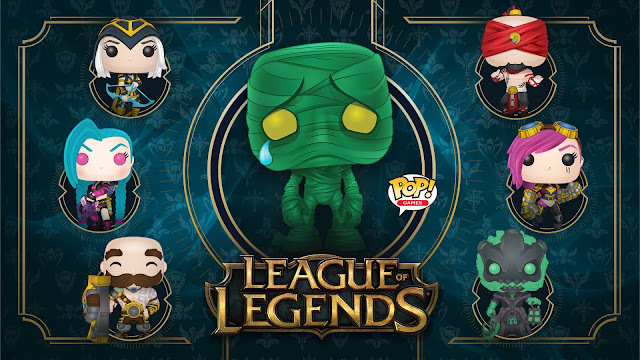 The previously revealed League of Legends Pop! vinyl figures are now available for purchase for NA players directly from Gamestop. These figures are currently only available in NA and will be made available in additional regions later this year! "League of Legends Pop! vinyl figures are available now at GameStop. You can choose from Vi, Braum, Jinx, Lee Sin, Ashe, and Thresh. The Pop! Collection is launching in North America but will become available in additional regions later in the year. Available now exclusively at GameStop in stores or online." Following the Yorick shovel teaser and the Yorick champion update GIF on social media, Reav3 hung around the boards to answer a few questions related to Yorick's upcoming champion update! His necklace, does it have any importance to his character or his story ? It is EXTREMELY important to his character and story." Like, does Yorick like Pizza and what's his favorite topping? Or does he have a favorite Ghoul and does he name them?! Lol, I'm still here. Should keep some Q & A for the official Q & A through. Surprised no one has asked about his cape made of Black Mist yet...."
IS THAT THE SAME BLACK MIST OF THE HARROWING? YES THAT VERY SAME BLACK MIST!" Anyone notice Thresh's lantern in the background from where the ghouls are coming? Do ghouls rise from dead bodies? Also there are 4 ghouls in this GIF, so he can summon at least 4 ghouls and, based on predicitons, can cause them to jump to the target location or unit. 4. Is it raining? Is is night time? Yorick is not a fan of Thresh"
Is he a fan of Morde at least? Morde is probably one of Yoricks least liked champions. Only person he might like less is the Ruined King"
You brought this upon yourself when you started to answer his likes and dislikes. What are his thoughts on kindred? Him and Kindred go way back man. I have probably said to much already :)"
Hm. I guess he's got some distinct thoughts on Kalista and Karthus then. He has distinct thoughts on most, if not all, of the Shadow Isles characters :)"
will the pentakill splash get an update? It will largely be the same splash except Yorick will be updated in it." It's his Idle. He puts the shovel in the ground and uses to prop himself up so you can see how big he really is. Generally the thing on his back (Which I am leaving vague on purpose right now) weighs him down more." You will have to wait just a bit longer." Two new LCS themed champion and skin bundles are now available through August 29th! "The top four teams from North America and Europe will face-off at LCS Summer Finals weekend in Kraków, Poland and Toronto, Ontario on August 27-28. It’s time for teams to make their mark on LCS history and earn a spot to represent their region at the 2016 League of Legends World Championship. Celebrate the pinnacle event of the LCS by unlocking our limited-time bundles featuring champions with the highest pick/ban rates from NA and EU LCS Summer Split. Both bundles are available until August 29. Tune in to LCS Summer Finals weekend starting on Saturday, August 27 for the 3rd place match. On Sunday, August 28, the final two teams will face-off to be crowned champions and represent their region at Worlds 2016. Head on over to Lolesports for more information about LCS Summer Finals including participating teams, tickets, match schedule, and more." "Hate to burst everyone's bubble, but that's just a unprocessed and unused line from his previous VO. Sorry everyone got so excited :("
The 2016 International Wildcard Qualifier starts up on August 24th and the full match schedule has been posted! The event is broken up into two parts - first is the round robin stage (8/24 -8/29) that pits eight teams from around the world again each other followed by the qualifier stage (9/3-9/4) where the top four teams will be narrowed down two that will move on to the 2016 World Championship! "The International Wildcard Qualifier (IWCQ) 2016 Round Robin kicks off in São Paulo,Brazil, August 24, with epic battles between the champions from Brazil, Latin America North (LAN), Latin America South (LAS), Japan, Russia/CIS, Oceania, Turkey, and Southeast Asia (Garena). After six days of competition at CBLoL studios, four teams say goodbye to Worlds 2016 dreams, and the other four advance to the Qualifiers, to be played at the Ópera de Arame, in Curitiba." Click here for more information and tune into the start of the round robin stage on August 24th! Speaking of LCS, EU LCS Summer Finals wrap up this weekend and here's a promo video to get you pumped! 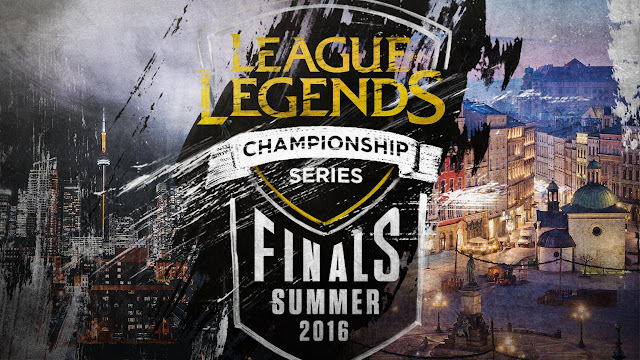 "Europe’s top teams converge on Kraków for the EU LCS Summer Finals taking place the 27th and 28th of August. Who will survive the fires of competition to claim victory?" Between now and August 26th, NA players can equip a team summoner icon and participate in the Lock In: NA Finals Icon Competition for a chance to win a signed event shirt by their favorite of the top four NA LCS finals teams - C9, TSM, IMT, and CLG! "Cloud9. Counter Logic Gaming. Immortals. TSM. Who will you lock in? It’s time to show your allegiance to Cloud9, Counter Logic Gaming, Immortals, or TSM. Share with us how you #NALCS with your favorite team gear, sporting an esports icon on the Rift, or share your team-inspired creations including art, cosplay, and more. If you play a League game with one of the NA Summer Finals team icons (C9, CLG, IMT, TSM) equipped on the NA server, you’ll earn an entry for a chance to win an autographed event shirt by the team whose icon you equipped. To make it even more epic for you, it’ll also be customized with your Summoner name. Since teamwork is OP, four friends of your choice will also win signed and customized shirts with you. By equipping your team’s icon, you’ll not only earn an entry into our competition but you’ll also join forces with fellow Summoners to show off your team pride. Games played with the icon equipped will count towards your team’s points/standing in a battle of team pride that will culminate on August 26. We’ll be tracking the progress below to show many players are excited for NA Summer Finals." Additional details and FAQ available here. "No new icons; rep your 2016 icons or icons from previous years for IMT, C9, CLG and TSM." "Hey Silfari, I'll be brutally honest with you on this one, international support was something we wanted to do for this pilot program but the legal blockers that popped up were too big for this event. The tl;dr of the situation is that this falls under "sweepstakes" laws, which are incredibly prohibitive in cross-regional spaces. For this first shot, we had to keep it to US + Canada because of this." "TL;DR: We’ve identified the cause of this bug, and it’s unique to Aurelion Sol. We’ll be implementing a fix on 6.18 (the Worlds patch). Read on for all the details. Yesterday during the NA LCS Semifinals between CLG and TSM, a game had to be remade due to a player seeing a Aurelion Sol's passive missile in the wrong place. Aurelion Sol's passive has the longest lasting missiles in League's history by quite a large margin, and they exposed a set of technical limitations we had never hit before with missiles. Most pertinent: this is the first time a missile is defining its motion around a unit that does not share its visibility. Previous missiles that moved based on another unit, like Ahri's Fox-Fire, share visibility with their owner - you only see the missile if you see the unit as well. In order to cope with this new problem, we put in some handling where the client is sent positional information about Aurelion Sol if one of his missiles is in vision but he himself is not. This allows the missiles to represent their movement without having to fully reveal the champion. However, there is a small time gap between the client gaining visibility of the missile and when it receives this positional information, and that gap is what ultimately led to Sunday's remake. For a few frames at game time 11:06, TSM Bjergsen's client displayed one of Aurelion Sol's passive missiles at the position it would have been if Aurelion was at his last known position - game time 10:31. It had received the information saying that the missile should be made visible, but had not yet received an update on where the champion was, so it showed the missile relative to his last known position. This Aurelion Sol defect has been present since he shipped. We had some code in place to mitigate effects of this nature for him, but they were clearly not enough. In the affected game, the circumstances were such that a player's decision making was negatively affected, and lead to a remake. We are fixing the issue by preventing the client from showing these missiles in the absence of accurate positional information. This fix will be a part of the 6.18 patch cycle, which is the patch Worlds will be played on. Can the bug be intentionally reproduced by either team? What circumstances cause it exactly? Why does it happen some times and not others? I believe it'd be quite hard to intentionally reproduce in a competitive environment. You would need to have the other team lose vision of you at an important position, and remain completely out of vision, only to reveal just your passive to that team some point in the future and a missile might show up at the previous position for a couple frames. It demonstrates infrequently due to many factors. One of which is simply that the position and timing of the effect is complicated and doesn't often arise in an organic environment in a way that's noticeable. There's also a strong timing component to this as well, where the client's framerate and network updates are effectively racing each other. Initially I had a difficult time replicating the issue on my workstation as I had capped my framerate to 30Hz, which allowed the network sync to usually land in time for the issue to not display." Last up we have a new /ALL Chat Summoner Showcase! "Everybody poops! Champions are no exception. This week's Summoner Showcase has some terrific live-action shorts from fans, cosplay so good it'll make you cry, and more! That’s right! ALL Chat is moving to both Mondays and Fridays. Twice the ALL Chat each week! Stay tuned for a new schedule here on the channel and on our social media things." There will be a CHROMA FOR IP sale between August 25th and September 8th! This means all chroma released PRIOR TO AUGUST 2016 will be on sale for 2000 IP each More information available here.